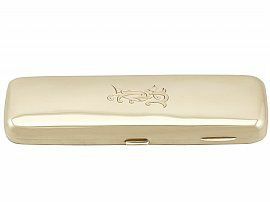 This exceptional antique George V 9 ct yellow gold cheroot/cigar case has a plain rectangular rounded form. The plain surface of the case is embellished with the contemporary engraved monograph initials 'Fh' to the centre of the cover. This yellow gold cigar case is fitted with a curved thumbpiece and push fit catch, which when released reveals two hinged compartments. The interior of this antique cigar case is fitted with the original retaining strap to one side. 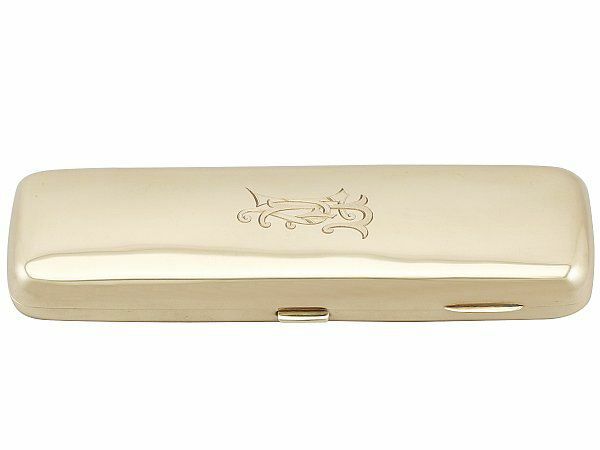 This antique gold cigar case is an exceptional gauge of gold, fine quality and in excellent presentation condition.